Heat gas or charcoal grill. In small microwavable bowl, mix barbecue sauce and marmalade. Remove 1/4 cup of the sauce mixture to small dish; set aside. On each of 4 (11-inch) metal skewers, thread chicken pieces, leaving 1/4-inch space between each piece. On 4 additional skewers, thread onion and bell pepper chunks, leaving 1/4-inch space between each piece. Brush chicken and vegetables with oil; sprinkle with seasoned salt. Place kabobs on grill over medium heat. Cover grill; cook 10 to 15 minutes, turning kabobs 2 or 3 times and brushing chicken and vegetables with reserved 1/4 cup sauce mixture during last 5 to 8 minutes of grilling, until chicken is no longer pink in center. Microwave remaining barbecue sauce mixture uncovered on High 20 to 30 seconds or until thoroughly heated. Serve sauce with kabobs. Serve kabobs with coleslaw and baked beans for a down-home dinner. Barbecue sauces vary widely in flavor, from a manufacturer’s original flavor to hickory, mesquite, honey, spicy, honey-mustard, sweet, sassy and low-sodium varieties. Experiment to find your favorite. Add something rich to your family’s Middle Eastern dinner! 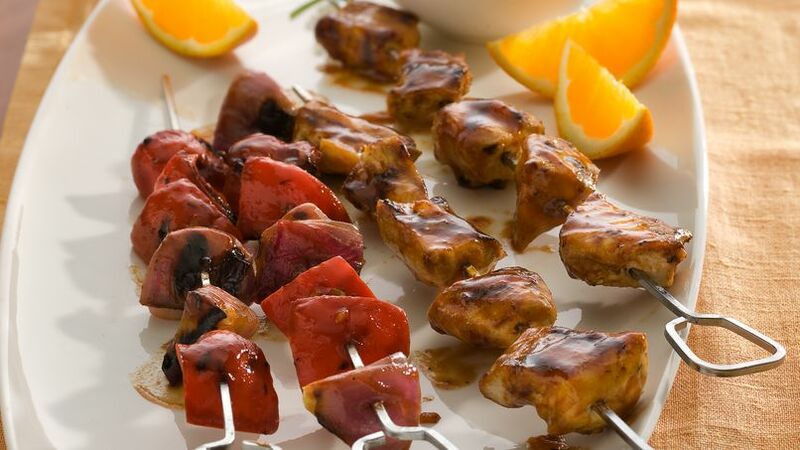 Serve tangy marmalade and barbecue sauce with this delicious grilled chicken and vegetable kabob - ready in 45 minutes.